Vélo Vogue: Potiche Photo Contest region extended - California wide! Potiche Photo Contest region extended - California wide! Thanks to the folks at Music Box Films, we can now offer movie passes to select California theaters to our winners (not just San Francisco)! Win a pair of tickets to a VIP Gilt City screening of Potiche in San Francisco taking place 3/30 (one winner). Win a pair of tickets for regular theatrical Mon-Thu screenings at select California theaters (two winners). 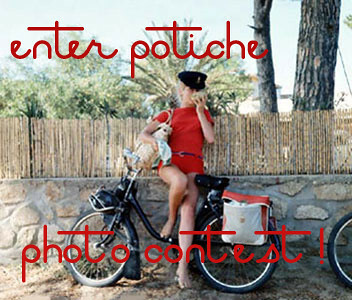 Submit your photo to our Potiche photo pool today! I love this contest, well almost as much as I love Catherine Deneuve! Kristin you looked wonderful on Eye On the Bay!!!! Shelly, I am awaiting your entry with baited breath! Bike Wardrobe Remix: What's New?